Hi to all the new visitors from Blogger's Quilt Festival. I am so happy you have stopped by to visit my little corner of blogland. I hope you will come back and visit often. I have been working frantically to finish this quilt in time for Blogger's Quilt Festival. What started as my Stitch Tease Bee quilt with an idea about 14 months ago has turned into a quilt that is so personal and special to me. It started with this strip made by me. My theme was WORDS and I left it up to my bee mates to think of a word that reminds them of me. My request was for them to make a strip to go with that word. You can read all about each strip here. After receiving this quilt top in April, I decided it needed one more row to acknowledge the women who made it for me . They have all become wonderful FRIENDS and so I decided to add a flag for each of the countries where they live and stamp their names on the strip. I used Kristie's fantastic pattern for paper pieced letters, which is available on Craftsy. I wanted to Free Motion quilt this by myself and I am not an accomplished machine quilter. Through sheer determination and a lot of tears, swearing and broken thread and needles, I quilted each row in a way to accentuate the perfect piecing done by my friends. A huge thank you to all my Instagram and blogging friends for their advice and encouragement when I was having thread breaking issues with my machine. Whether it was applique, paper pieced or patchwork, I wanted to make sure not to distract from the design. I squiggled, I stippled and made pebbles; I swirled hearts and wrote words and stitched stacked blocks and stitched lots of wonky, wiggly lines. I even attempted to quilt clamshells. This has been a real learning experience for me as far as free-motion quilting goes. I'm hoping, with practice [on smaller quilts next time] that my skills can only get better. I would say I almost have pebbles and swirls conquered. My favorite idea has to be the quilted weather related words in Dianne's row. The perfect fabric to back this quilt is the IKEA Britten number words fabric. I bound this quilt with a black and white mini stripe by Timeless Treasures. 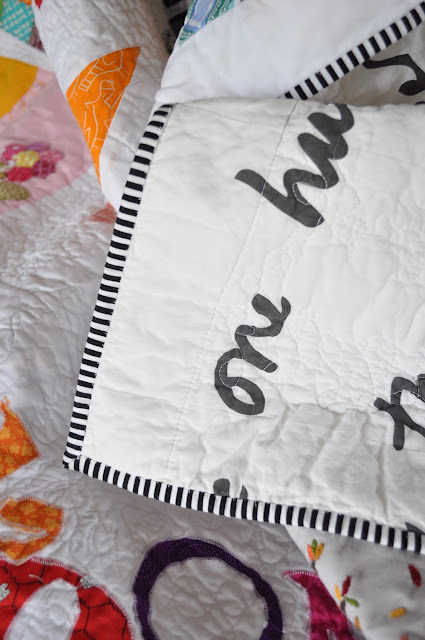 It frames the quilt without drawing attention away from the quilt, don't you think? I'm pretty proud of this quilt and it will be hung on my studio wall as a reminder of the lovely and talented friends I have all over the world. I am entering it under the Bee category in the Festival. 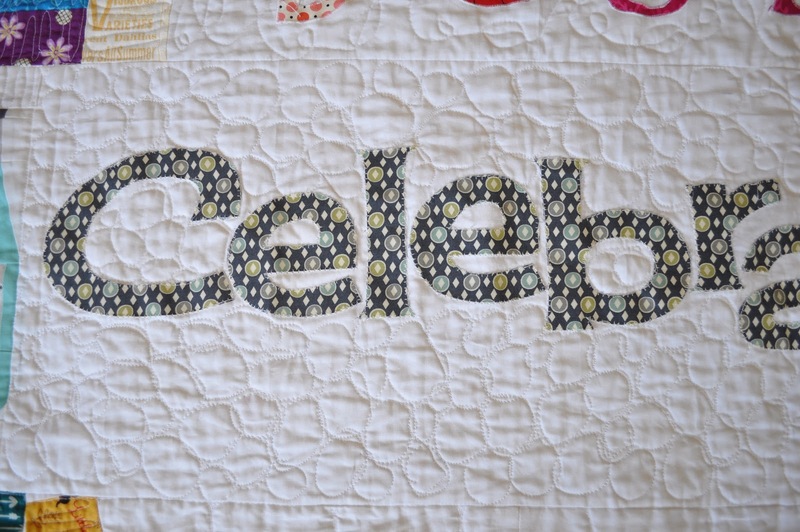 I hope you will go and enjoy all the beautiful creative talents of the blogging quilt community. Quilted by me with Aurifil 40 wt. and Isacord 40 wt. both in white. Wow, Diane, your quilting really makes this stunning quilt even better. You are clearly a natural at machine quilting. It is a wonderful quilt for you from such good friends. I love this! Such a wonderful treasure to keep forever! You did a great job on the quilting! It's fabulous and so special! Love this quilt! Have been following your quilting progress on IG and I just love what you did with it. It's just beautiful - such a special quilt! Awesome Di! I love how each row is quilted differently. Your words look great. I'm so happy for you! I am so happy to get to see this quilt all done. It is beautiful! Congrats on sticking out the free-motion adventure. Pits amazing Di. And the quilting is brilliant. I didn't see the names before, or that you did my bit with words! A rely unique quilt. Wow, I'm truly impressed with all your quilting - good for you!! It is an amazing quilt! How you fmq'd this on a domestic machine is beyond me because I happen to know exactly how big it is. You did a spectacular job. 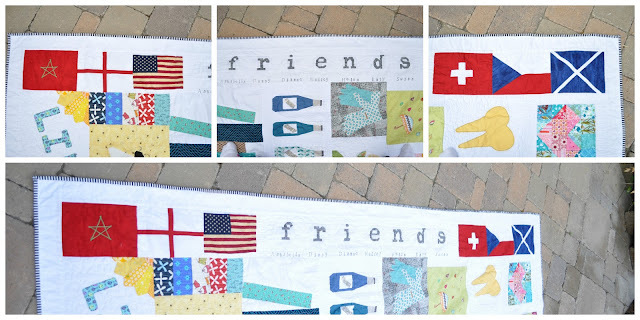 I love your addition of friends and the flags. I think you took a very personal quilt top, Di, and took it to another level. I am so proud to have been able to contribute. You are phenomenal, and a great friend too. You've done an incredible job with this! No wonder you needed regular massages! Did you try a glass of red? They tell me that loosens things up, in the quilting department of course! It's a great quilt and a very special one! Wonderful. I love the idea behind it. I would be proud of this too. Great make and so glad you managed to finish it! Well done on the FMQ - looks like you do have swirls, pebbles and writing under your belt! This is just amazing quilt! I love how there are so many different things and blocks and colours are beautiful! Woe. 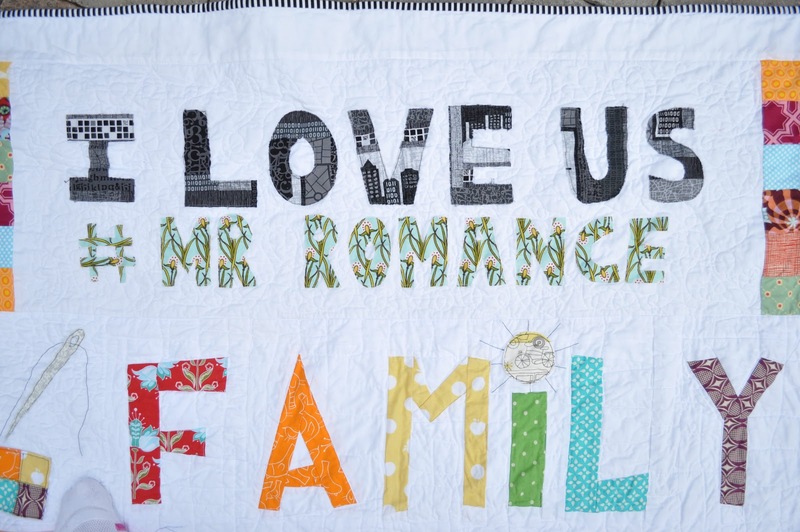 I see words and messages are common in all the group quilts included in the Festival. Yours is amazing! I love the quilting on it. Congrats! This one is truly a beauty, with all the "mistakes" as well. You all really did a great job with this one. Your quilt is fantastic. Well done. Wow Diane. Such a wonderful account of the process. All the trials were worth the effort! It's fabulous and a real treasure. This is a pretty awesome quilt! I love how personal it is to you - and that great hamming it up photo of your sons! It's stunning!! I love the extra strip you added - genius! An absolute treasure, your quilt. I am so happy for you in the joy it must bring! It's a perfect quilt. This is one amazing quilt. 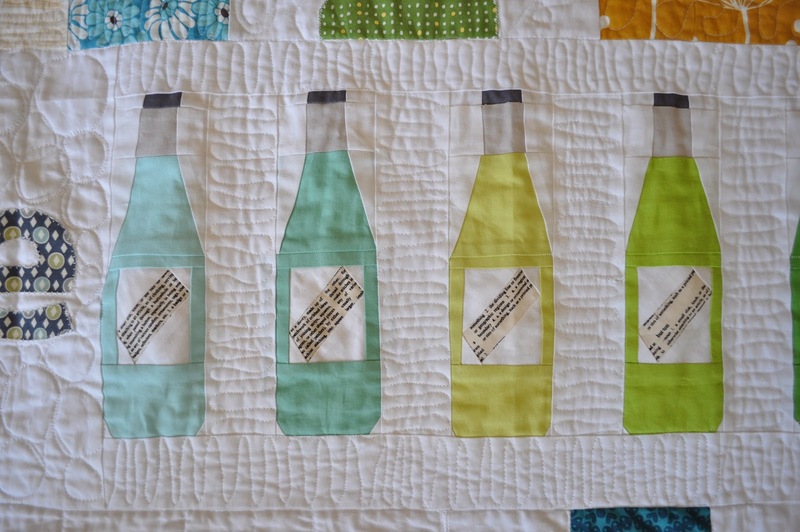 I love all the different types of quilting. You will treasure this forever. I'm so impressed you got it done in time! It's just perfect. This is totally fantastic. I love the concept, I love how it looks, you must be super-thrilled! 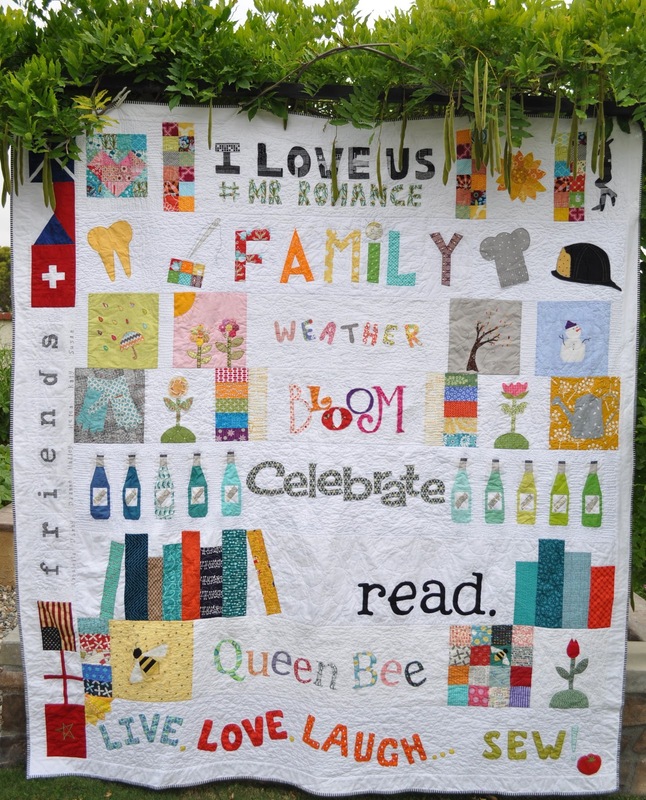 I think this is such a personal quilt between friends which is what a bee should bee! You get my vote! Simply beautiful! So unique and personal - what a great quilt! You did a great job on the quilting too! i have loved watching your progress on this quilt over IG. it is truly special. Diane, it's fantastic! Great job on the quilting too! A great tribute from and to a great group of friends! I totally love your quilt and each row! My son appreciates that your sons are holding your strip. Perhaps a "Sons of Quilters United" group can form among all of our quilt holders! Oh, what a special quilt! It is wonderful! What a fantastic memory quilt! I'm glad you persevered with the quilting. Thanks for sharing. This is beautiful and the quilting is lovely!